Recently, our world has been terrifying. Mass shootings, bombings and other acts of division and terrorism have rippled across the Western World. France has proven victim to two especially heinous acts of terrorism. In January 2015, two Islamist gunmen entered the headquarter of the satirical French Magazine Charlie Hebdo and killed ten staffers and two police officers. This attack was perpetrated partly because Hebdo had published a cartoon featuring Muhammad’s face, which is prohibited by Islam. After the attack many took to social media so show their support for the victims with the slogan “Je suis Charlie,” meaning “I am Charlie” in French. Later in 2015 agents of ISIS killed hundreds in several coordinated attacks in Paris. One of the centers of the Paris attacks was at the concert of an American rock band. These acts of terror were attacks on the freedom of expression. It’s no coincidence that France, the home of satire, was the target of several terrorist attacks. What’s surprising is that our Freedom of Speech is under attack not only by terrorists but also by ordinary citizens. Freedom of speech has always played a central role in democratic Western politics and society. Some nations have more restrictions on Freedom of Speech than others but most nations have provisions for it. Canada and the United States tend to have fewer restrictions while nations such as France, Germany and Great Britain have more. In the United States people take pride in their ability to speak out against things they find wrong without fear of repercussion. Many changes have been forced in government, the military and in the corporate world because of the freedom of speech enjoyed by US citizens. The founding of the United States can be traced back to Freedom of Speech. For centuries, British culture had included a rich tradition of Freedom of Speech. In the American colonies, some colonists used this to speak out against Great Britain through newspapers and publications. One example of this is Thomas Payne’s Common Sense. The right to free speech is guaranteed to US citizens through the First Amendment. Quite literally people have died for their right to free speech in America and now in France. Now a debate led by many students at highly respected private schools have started a movement to limit Freedom of Speech. A movement has started throughout Europe and North America to limit so called “Hate Speech”. This movement was started on college campus’s throughout the mid 2000’s by activists in order to try and eliminate speech that preys on the marginalized and defenseless. On a side note, many European countries have hate speech laws similar to what activists propose in the United States. Hate speech activists say that derisive and insulting speech can divide and incite hatred between people. Furthermore activists claim that “hate speech” isn’t guaranteed for Americans under their first amendment rights. They further say that since “hate speech” is often homophobic and racist it would be wrong to oppose it. Some activists go as far as to argue that a ban on hurtful speech could have prevented attacks such as the one on Charlie Hebdo. Recently at Yale University, filmmaker Ami Horowitz, attracted over fifty students to sign a petition repealing the First Amendment. Judging by this, some of our best and brightest feel that hate speech outweighs the importance of the Freedom of Speech. According to the Pew Research Center up to forty percent of millennials would support some restrictions on speech deemed offensive to minorities. 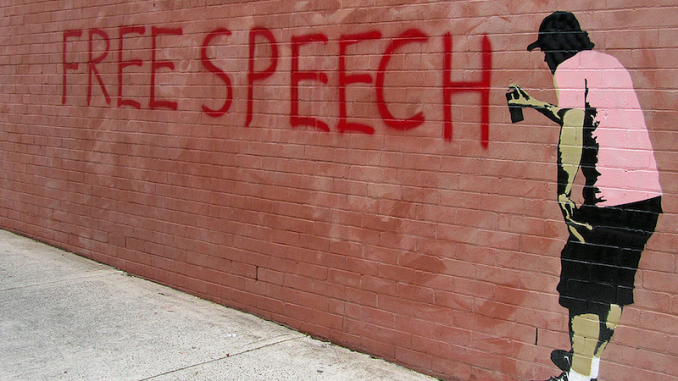 Among younger Americans, Freedom of Speech has certainly become an issue. As an American I have always felt a distinctive pride in my ability to state my opinion on issues I feel strongly about. I think anything less is an insult to our for-bearers. What makes Freedom of Speech great is it’s self censorship. While you can say what you want, you might face social repercussions for doing so. For example if I yelled racial slurs at the top of my lungs, I would face social consequences. I would be ostracized if I continued to say offensive things. My parents would probably yell at me, my friends would tell me to stop and eventually a rational person would acquiesce. While words can be hurtful they aren’t something you can monitor and ban as that would be akin to censorship. The problem with “Hate Speech” is simple. How do you define it? People objectively talk about banning hate speech while defining it is entirely subjective. My definition of hate speech could be completely different than yours. It’s impossible to democratically define what’s offensive without infringing on our first amendment rights. The right to freedom of expression is clearly defined in the Constitution. What if the fact that someone openly leads an alternate lifestyle offended you? Might that eventually become included under hate speech? Our First Amendment rights are too important to give away in order to stop people from getting their feelings hurt. Don’t get me wrong, what people define as “hate speech” is usually obnoxious, offensive and immoral, but passing laws against it will only limit our rights instead of solving the problem. George Washington once said “If freedom of speech is taken away, then dumb and silent we may be led, like sheep to the slaughter.” Take it from our Founding Father, freedom of speech and the First Amendment are too important to be given away. Jimmy Connolly is a senior at Clayton A. Bouton High School, a staff writer for The Blackbird Review, and our resident movie critic. Winners of the 2019 Voorheesville Short Story Contest Announced! The Blackbird Review is a production of the Cole Summer Writers Institute and the Clayton A. Bouton High School/Voorheesville Middle School English Department. Production of the print edition is made possible by a generous grant from the Voorheesville Community and School Foundation.